As promised here’s Essie’s For The Twill Of It from their same named Fall collection 2013: As with OPI’s Peace & Love & OPI it is a grey based duo chrome that shifts from blue to purple. The formula is perfect. This is two coats without top coat. And here’s a bottle shot… GORGEOUS! Thanks for reading! 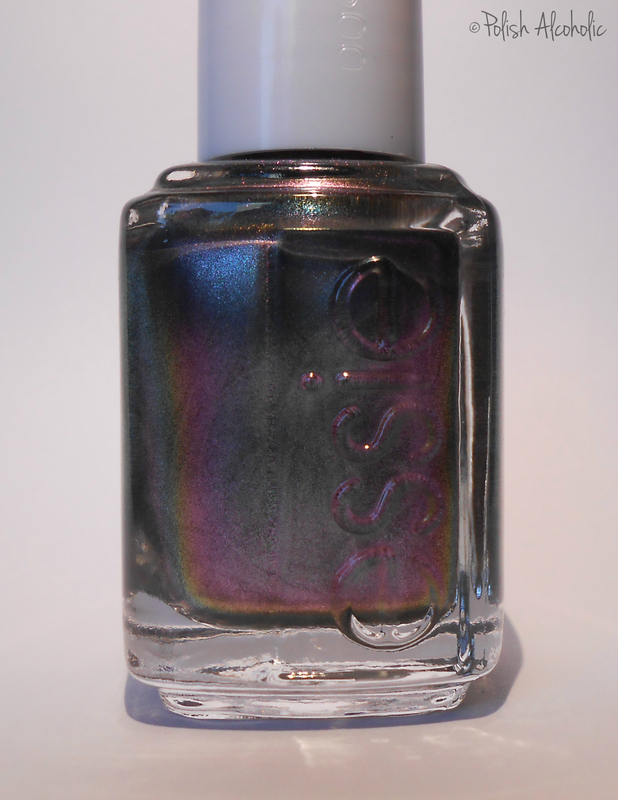 This entry was posted in Essie and tagged duochrome, essie duochrome, essie fall 2013, essie for the twill of it, for the twill of it, for the twill of it swatch, for the twill of it vs peace love opi by Polish Alcoholic. Bookmark the permalink. Yeah! Your nails are back again! Gorgeous swatches! Yay for that! 😀 Haha! Thanks sweetie! I love that bottle shot! I wish I liked long nails on myself because yours always look so beautiful. Thanks for the comparison, they really are exact matches, huh? I wonder if there’s a controversy among the shade developers at either company over who made it first? Oh wow… maybe there is some sort of controversy between them all. Makes me wonder. It does weird things to my skintone. Oh that is such a pity because it’s such a lovely polish!